Lush have introduced quite a few of the Oxford Street exclusives into your everyday Lush store. I've already reviewed The Experimenter but now it's time to talk about their Yoga Bomb. I spotted this product online and it immediately caught my eye due to the simplicity of an orange ball and the description made it sound perfect for a relaxing experience so when I popped into Lush I was eager to pick it up, the scent is slightly citrusy but nothing overwhelming, the only thing that I was a little doubtful of was the shimmer. 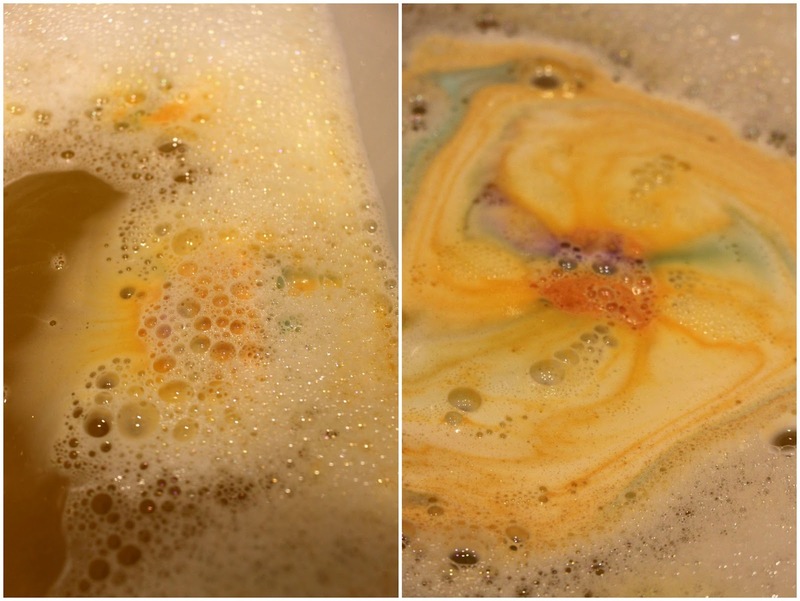 When placed in the bath it fizzed straight away turning the water orange, filling it with bubbles and shimmer. The scent was different to what I'd usually go for with Lush products but I definitely liked it and it suited the bomb completely. It carried on dissolving leaving the center of the bomb with shades of purple and blue slowly emerging, not exactly anything special but still pretty. In total it probably took around ten minutes to dissolve completely. During my hour long bath the bubbles didn't fade and of course nor did the scent, in fact I'm writing this a few hours after the bath and I can still smell the fragrance on my skin, no complaints though! Well, no complaints about the scent that is..
Yup, that's a nice pile of gold glitter after my bath was completely drained. This bomb screams relaxation so the last thing I want to do when I'm finished having a calm bath day dreaming my worries away is having to clean the tub down because it's filled with a crap load of glitter. I'm used to washing away a bit of shimmer, colour or bubbles, that's kind of a necessity with any Lush bath product, but I actually had to wipe down the tub for a while and even then there was still speckles of glitter around. I also feel like Edward Cullen in the sunshine. I love the idea of the bomb and I'm glad I purchased it but the shimmer completely let it down for me, not just because of the aftermath but the whole time I kept looking at the water and seeing all the gold speckles and worrying about whether I was turning into a discoball the longer I stayed in the bath. I'm sure there's plenty of people who love this bomb, some of the reviews I've read prove that but it's not one I shall repurchase, though there's plenty of others I love so no disappointment!